A high-performance, low-spin driving iron with a striking profile that inspires confidence, the 0311X is designed to deliver a more penetrating ball flight, keeping the golf ball out of the wind and in the middle of the fairway. Optimize your performance with a blended set just like PXG’s touring professionals. 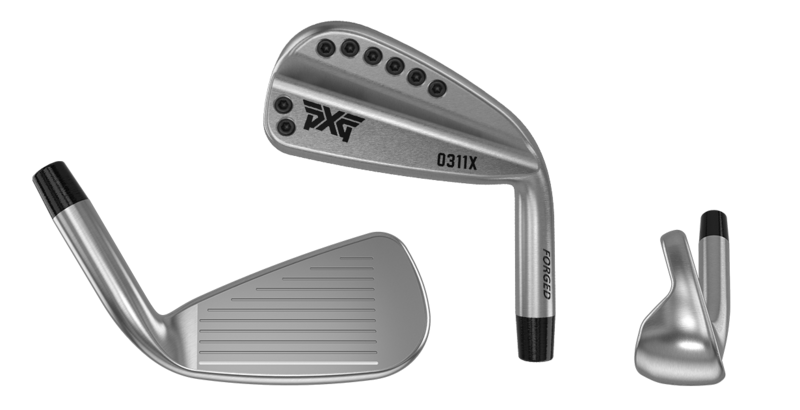 PXG 0311X driving irons are designed to augment your bag for a more penetrating ball flight to accommodate tight golf course setups or adverse weather conditions. The body of the 0311X driving iron is forged from 8620 soft carbon steel. Forged materials, having a tight grain structure, resonate differently than cast materials, which creates an outstanding impact experience. TPE (Thermoplastic Elastomer) is a low-density, vibration-dampening material that enhances a club’s sound and feel. TPE adds structural stability for PXG’s patented ultra-thin face and helps to produce a more efficient energy transfer. The wide TPE section in the 0311X ensures a soft-yet-solid feel. The ultra-thin face is formed from HT1770 high-strength steel. The patented technology of an ultra-thin face coupled with TPE material results in higher ball speeds and longer distances. By removing a significant amount of mass from the center of the club head through CNC milling and strategically repositioning it around the perimeter with tungsten weighting, the forgiveness of the PXG 0311X driving iron is exceptional. The minimal offset of the 0311X driving iron creates a sleek profile and inspires confidence at address. Less offset produces a lower flighted shot. The 0311X driving irons have a wide sole. This helps lower the CG, producing less spin with a more penetrating ball flight.